Exclusive! All trimmed and ready for the big day! Set against a snowy winter backdrop, this hilarious reindeer doesn't realize he's not a Christmas tree! 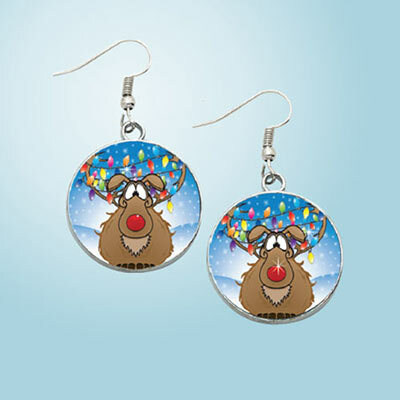 Fun and frolicsome earrings are the perfect accessory for holiday festivities. Great gift or stocking stuffer, too! Round metal earrings; French wires, 1¾"l. Metal with image on front.